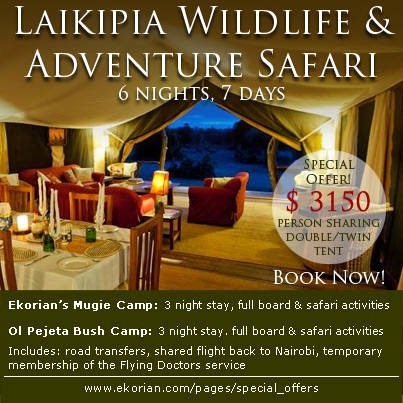 Ekorian’s Mugie Camp is a private camp with an exclusive location on the Mugie Sanctuary in North Laikipia, where game and birdlife viewing is prolific. The camp is the family base of Josh and Donna Perrett. The camp is simply designed with a central mess area and six, spacious but cosy tents, each ensuite with hot and cold running water and flush toilets, under thatched roofs with wooden decks. Celebrate LOVE this VALENTINES WEEKEND while you stay with us! Rates include Safarilink flights from Wilson Airport, Nairobi to Loisaba Airstrip, transfers to and from Ekorians Mugie Camp and all activities except green fees. Road transfer to airstrip for a shared flight back to Nairobi Wilson Airport, arriving at lunch time. Road transfers described, full board accommodation and safari activities, Ol Pejeta Conservancy and Mugie Sanctuary fees, shared flight back to Nairobi, temporary membership of the Flying Doctors. Travel insurance (a requirement of booking), drinks at camps, Nairobi meals and entrance fees. At Ol Pejeta Conservancy: visits to the Northern White Rhino $ 40 per person; tracking lions $ 40 per person. At Ekorian’s Mugie Camp: golf green fees $ 30 per person, cultural village boma visits $ 100 per visit. It's Great To Be Back!